MIXED BAG: The VX2255wmb had strong and weak points. Pros: Incorporates a digital camera into display, good blues. Cons: Light bleeds in on top and bottom of display, brightness not at all uniform. The ViewSonic VX2255wmb is an innovative 22-inch LCD with a lot of neat extra features that might make the $429 price attractive to some users. However, it just barely gets above-average marks in our display testing, and it has several significant flaws in its design. The VX2255wmb has excellent color ramping and is able to display subtle variations in most colors, especially red and blue, without harming the hue or saturation of the original image. It is also fairly good at dark colors. Two of its biggest faults are screen brightness uniformity and light bleed. There is a 23 percent difference in brightness between the center and the corners and edges, which is going to be noticeable to most people. This was the worst variance in the review. Also, the edge bezel itself does not hug the screen very well, allowing some white backlight to spill onto the screen at the top and bottom of the display, which tends to counter its good performance for displaying dark images. This is a design flaw that can't be compensated for by adjusting the monitor. 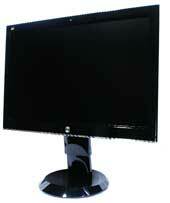 The VX2255wmb has a great monitor stand that can tilt in all directions. The coolest part, however, is the base of the stand, which is set up like a Lazy Susan so you can turn the monitor easily without much friction and without having to move the stand itself. There is also a 1.3-megapixel camera mounted on top of the monitor, so you can do videoconferencing out of the box. However, we question why it is only 1.3 megapixels, considering most cell phones are better equipped. If you are going to add a camera to a monitor ' which we think is a great idea ' at least make it a good one. The VX2255wmb is an above-average monitor with a lot of nice extra features. It is far from high end, but might be a good choice for casual users who need a large display.